And the race is on! Who will be the first to fly: the clever and calculating Wright brothers of the bumbling and not-so-clever (fictional) Wrong brothers? 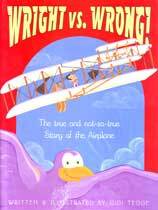 Wright vs. Wrong is an amusing and colorful story about the race to invent the airplane. The Wrong brothers, of course, never existed. Come along on this crazy contest, and one will a lot about planning, perseverance and, of course, the first airplane. The efforts of the Wrong brothers is made up, the efforts of the Wright brothers is factual. Many of the illustrations are actually based on historical photos of the inventors.